Be the first to share your favorite memory, photo or story of Brenda. This memorial page is dedicated for family, friends and future generations to celebrate the life of their loved one. 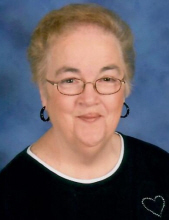 Brenda Kay Young, 77, of Mulkeytown, Illinois, passed away Saturday January 26, 2019 in her residence at 10:30p.m. Brenda was born July 18, 1941 in White County, Illinois to Byron and Irene (Spence) Hill. She loved her family especially her grandchildren and great grandchildren. Brenda was a member of the Cleburne Baptist Church for many years. For many years, she was teacher's aide for Zeigler/Royalton Schools and Head Start in West Frankfort. She also enjoyed going to Z-R sporting events. Brenda was also a hairdresser. She was preceded in death by her parents; brothers-in-law, Robert Hill and Doug Price. Brenda is survived by her husband Ed Young whom she married on September 27, 1965; two sons: Tim and Steve Young; daughters-in-law, Lisa Young and Gaye Young; brother, Stan (Nancy) Hill; sisters: Carol Hill, Gayla (Ron) Hargrave, and Diane (Wayne) Browning; sisters-in-law, Becky (Denny) Grant and Bea Price; grandchildren: Jordan (Connor) Culpepper, Shaye (Eric) Russell, and Josh Young; great grandchildren: Karson Russell and Kendall Culpepper; several nieces and nephews. Funeral services will be at 11:00a.m. on Thursday January 31, 2019 at Union Funeral Home - West Frankfort, Illinois with Denny Bush and Kendall Jones officiating. Burial will be in St. Aloysius Catholic Cemetery - Royalton, Illinois. Visitation will be from 5:00-8:00p.m. on Wednesday January 30, 2019 at the funeral home. Memorials may be made to Celeburnce Baptist Church or Hospice of Southern Illinois. Envelopes will be available and accepted at the funeral home. To send flowers or a remembrance gift to the family of Brenda Kay Young, please visit our Tribute Store. "Email Address" would like to share the life celebration of Brenda Kay Young. Click on the "link" to go to share a favorite memory or leave a condolence message for the family.